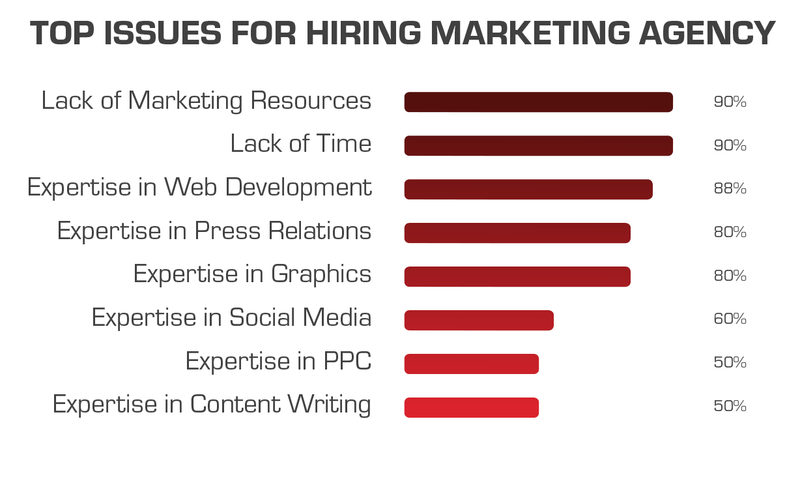 Many companies face the choice between hiring a marketing agency versus hiring or utilizing in-house marketing resources. To help you make the right choice for your organization, here’s an overview of the requirements, issues and benefits for hiring a marketing agency for your needs with press relations, website development, advertising, brochures, white papers, tradeshows and more. The major factors affecting in-house marketing is the ever increasing work load and required expertise in so many different areas. Small to mid-size firms may lack resources or expertise to provide a full product launch or marketing program. Even large companies with extensive marketing departments utilize marketing agencies to balance heavy workloads and complete tasks quickly with needed expertise. If you select a marketing agency with experience in your industry, they can provide you with faster results with the right approach to determine the best strategy to reach your goals. You also benefit from the diverse skill sets that an agency can afford hire, and top of the line data collection services. In addition to the expertise of marketing consultants your firm will also have an external resource that can share experience and industry knowledge to help your company develop an impactful B2B marketing program that has proven to work with other companies. By hiring an agency, you can free up other resources within your company and achieve faster, more professional results at a reduced cost. When making the in-house employee vs. marketing agency cost-based decisions, it’s critically important to properly account for all the hidden costs per employee and the added opportunity costs such as level of expertise and time to complete projects in-house versus agency involved to make a sound business decision. "Marketing Agency vs. In-house Marketing"